Citrus County is a golfer’s candy store! Over 20 golf courses reside within a 30 minute drive - including four ranked among the top 100 in the nation by Golf Digest magazine. We have assembled brief descriptions for your convenience. Please bookmark this site and feel free to refer to it at any time. Finally remember, "It's a Gimme" when you choose ERA American Realty to handle your golf home real estate needs. From the remnants of an abandoned tract of land, home to enormous limestone quarries has emerged 45 of golf's most challenging and amazing holes. Black Diamond Ranch has emerged as one of the top-ranked courses in the world. Two challenging championship golf courses surround a multi-million dollar activities complex. The Meadows Course tempts the unwary golfer to swing big. The Oaks course lives up to its name with beautiful old Florida oaks dotting the course. This Charles Almony designed golf course is blessed with a large variety of trees including many beautiful live oaks. This course is reminiscent of North Carolina courses with plenty of rolling terrain and very little water. The Dunes is cut out of a densely wooded area. Unique usage of the naturally sandy soil and terrain features challenges the accuracy of the player. This course has been and remains one of the best values in the Central Florida area. Be sure to try your luck on this naturally beautiful and challenging course. Inverness Golf and Country Club is a 50 year old, 18 hole private club offering a club house with restaurant, lounge, pro shop, swimming pool, lighted tennis courts, driving range and practice putting green. 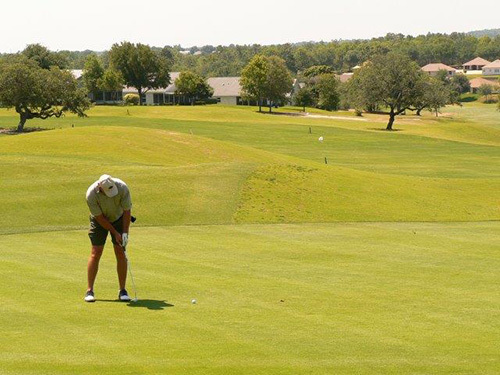 Formerly Pine Ridge Golf & Country Club, Highland Hills is one of Citrus County's most desirable courses, offering golfers of all abilities an outstanding venue to test their skills. Tree lined and rolling fairways with narrow landing areas and strategically placed bunkers present a challenge from each set of tees. 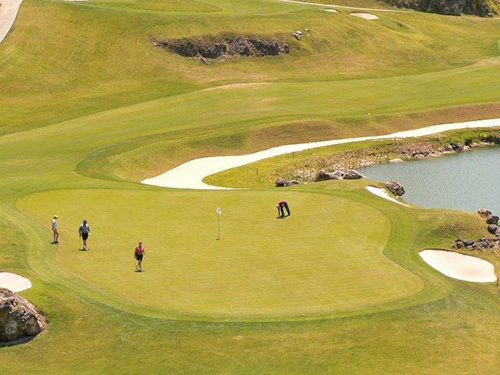 This club has an outstanding eighteen-hole course and a nine-hole course. Located near the beautiful Kings Bays in Crystal River, the Championship Course has wide fairways and water hazards coming into play on almost every hole. This course is great for the average golfer. This course is flat and very walkable. You will enjoy this excellent course for the casual golfer. You can brush up on your game as you enjoy a wonderful community. Tucked away just outside of Crystal River, this course is well maintained and full of water hazards. The seasonal golfer will love to call this course home. Bring extra balls because the 28 plus water hazards and resident alligators are sure to claim more than one. Skyview at Terra Vista may be the best "hidden secret" on the Nature Coast. Skyview's "Mountainous" terrain will take your breath away ... not because of the height, because of its endless vistas. On a clear day you can see the Gulf of Mexico! This course was nominated by "Golf Digest" as the Best New Private Course in the U.S. for 1993. It has flat with wide fairways, thick rough and large tricky greens. With about 25,000 rounds per year the course is a pleasure to play. This club utilizes three nine-hole courses that are played mixed and matched to make three eighteen-hole combinations. The courses are set in a planned deed restricted community offering many green belts and privacy cul-de-sacs. A challenging Par 72, 18 holes with rolling, tree lined fairways and always in tournament condition. Greens are generous, fast, smooth, and allow for lots of birdie opportunities. Every hole has a unique, individual character. You will never get tired of playing this course; it's fun and always challenges your game. Two Tom Fazio eighteen hole championship courses in one great place! Add a nine-hole executive course, and you have the world of golf - or World Woods Golf Club. Many Citrus County Florida golf communities and golf courses have residential real estate available, from new homes & lots, to re-sale homes and condos. In most Florida Golf Course Communities you will find beautiful views, beautiful sunsets and/or sunrises. If you're looking for property in a particular area or on or near a specific golf course, we have listings you will want to check out. New construction golf course homes often features custom house plans in a variety of styles and prices. New homes as well as existing homes within some golf communities offer you the opportunity to include golf club memberships with your home purchase. Many also offer fitness centers, tennis courts, and community pools to go along with your new luxury home on the golf course. ERA American Realty is your guide to the Central Florida area's premier golf homes, golf communities and golf real estate. We have extensive experience and information on amenities, golf courses, currently available homes, golf home and lot prices, along with photos of homes and the communities themselves. For further, specific golf course home information, please contact us today!